If you’re going to retire in Florida, it only makes sense to live in one of the over 55 communities located near the beach. Like many people, though, you might think that living in a beach community is simply out of your price range. But, at Bear Creek, living the Florida lifestyle is surprisingly affordable. In this gated, secure community our residents live in gorgeous, low-maintenance manufactured homes that are priced to fit into just about anyone’s budget, making it affordable to live in beautiful Ormond Beach on Florida’s illustrious Atlantic coast. Soaking up the sun on the Atlantic beaches – Mere minutes from some of Florida’s most beautiful white sand beaches, Bear Creek provides the ultimate Florida lifestyle. Whether you want to frolic in the ocean, walk along the beach, collect seashells, or work on your tan, Florida’s east coast is the ideal setting. While some retirees pay a premium to live in similar over 55 communities in Florida, Bear Creek offers an affordable resort lifestyle. 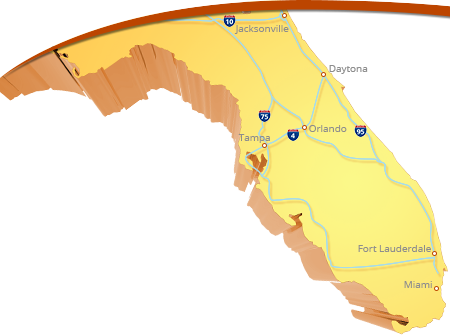 Exploring Florida’s most popular attractions – Bear Creek is in close proximity to Orlando, Daytona, and St. Augustine, three of the Sunshine State’s most popular places to visit. Orlando is home to several amusement parks, including Disney World, SeaWorld, and Universal Studios, while Daytona is best known for hosting the annual Daytona 500 NASCAR race. St. Augustine is known as the Nation’s Oldest City and is a popular destination for history buffs. Relaxing and enjoying impressive onsite amenities – While there are many exciting attractions outside of Bear Creek, there are also countless amenities on site. Many over 55 communities are lacking in onsite amenities, but our community has not one, but three fully appointed clubhouses, three swimming pools, dance floors, billiards rooms, whirlpool spas, tennis and pickleball courts, horseshoes, a craft room, and much more. There are also plenty of spaces for relaxing and taking in Bear Creek’s gorgeous woodsy views. Many people who visit Bear Creek assume that it’s one of the pricier over 55 communities in Florida, simply because of its outstanding location and amazing amenities. But, living in Bear Creek is incredibly affordable. All onsite amenities and maintenance of common areas is included in one low, monthly homesite lease payment. What’s more, our gorgeous manufactured homes are economically priced, truly making the Florida lifestyle affordable. To learn more about Bear Creek and why it’s one of Florida’s premier retirement communities, contact us today. If you’re interested, be sure to ask about the other over 55 communities that our parent company, Blair Group, owns and operates in Central Florida. Click here to learn more about Bear Creek!